Bill Garrett is unquestionably one of the greatest players to ever don the Cream and Crimson. He was a statistical record setter, a team MVP, and an All American. Bill Garrett is also, unquestionably, one of the most important students (let alone basketball players) ever to attend Indiana University. 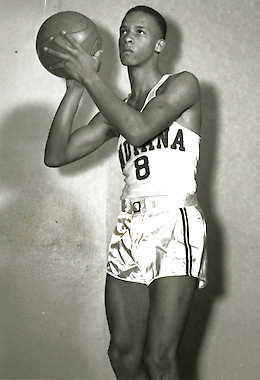 He was the first black player to ever play at Indiana, and is credited with breaking the gentlemen’s agreement among Big Ten teams to not recruit and play black players, which had been in place for decades. Similar agreements were in place at conferences across the country. Garrett’s successful career at Indiana was an important driver in these unconscionable agreements breaking down and college basketball slowly, but surely, becoming the fully integrated game we watch and love today. Given his achievements as a player, and what he represented off the court, it seems obvious to many that Garrett should be in the Basketball Hall of Fame. He’s not, however. Hopefully that changes some day, and perhaps this weekend’s events will help spur such a change. This weekend, an Indiana State Historical Marker will be unveiled on Indiana’s campus that will commemorate the legacy of Bill Garrett. It’s been a long time coming. To read the Herald-Times story about the marker unveiling, click here. For additional details on the ceremony and how to attend, click here. On this episode of The Assembly Call, Tom Graham joins me to discuss the ceremony and Bill Garrett’s remarkable story and legacy. If ever there has been a “can’t miss” episode of The Assembly Call, I believe it is this one. Tom is the authority on the subject, as he co-authored the book Getting Open: The Unknown Story of Bill Garrett and the Integration of College Basketball with his daughter Rachel. I wrote about the book, and the profound impact it had on me, in this blog post back in December. To order the book, which you should absolutely do after listening to this conversation, click here. I hope you enjoy this episode, and I hope you’ll share it with the IU fans and alums in your life. The story and legacy of Bill Garrett isn’t always easy or comfortable to reflect upon, but it’s one that deserves reflection and that, ultimately, we should all be proud of as Hoosiers. This episode of The Assembly Call is brought to you by Hoosier Proud, Crane Credit Union, and SeatGeek. Get a $150 deposit into your new Crane Credit Union checking account when you get e-statements, have direct deposit, and use your debit card. Plus, there’s no monthly service charges and no minimum balance to open your account. Stop in to any of Crane Credit Union’s 14 locations or visit their website at cranecu.org for more information. Use the promo code ASSEMBLY at hoosierproud.com for 15% off your entire order of shirts and accessories designed for the proud Hoosier. Use the promo code ASSEMBLY at seatgeek.com or with the free SeatGeek mobile app and get a $20 rebate on your first ticket purchase.